One of the most contested issues in a divorce other than child custody is the disposition of the marital home. Not only is it an emotional investment, it is often a most significant asset when dividing marital property. When trying to decide whether to keep the home or sell it, there is a lot to consider. There are a couple of approaches to keeping the family home, one of which is remaining on the mortgage with your spouse and working out who will make the monthly mortgage, property tax and insurance payments and how costs for regular maintenance will be handled. Sometimes couples consider this option when there are children still at home, especially if one spouse is unable to refinance the house and buy out the other at the time of the divorce. In this scenario, there is often a plan to sell or have one spouse acquire the home at some point in the future when the kids are grown or the other spouse is able to purchase the home outright. If you intend to keep the home and prefer to make a clean break from your spouse, you must be able to refinance the home, reimburse your spouse for their share of the equity, and prepare to pay for expenses related to the home on one income. During a refinance a spouse may be able to work in additional funds to reimburse the other spouse for their share of equity if they do not have other assets to trade. For some keeping the family home is a good option, other times it may be better to split the proceeds and downsize. Whether you refinance solely, keep the original mortgage jointly, or decide to sell, it is always important to consider the bigger picture of the housing market in relation to your home, the difference in capital gains tax treatment – married versus single, and other related issues. An experienced divorce attorney can provide you with information so that you can make the best decision regarding the disposition of the marital home in a divorce. Sometimes couples agree to sell the house outright and split the proceeds. Other times, one spouse may want to keep the home, but have no choice in the matter because they cannot qualify to refinance the home on their own and/or cannot buy out the others share of equity in the home or relinquish marital assets equal in value to the other spouse’s share. If you and your spouse end up selling the home, there will be appraiser and other fees and costs associated with putting the house on the market which will have to be divided whether you and your spouse split the amount up front or one is compensated in the property settlement agreement after the fact. Be sure to discuss the costs of selling your home with your attorney so you will be reimbursed for these expenses. 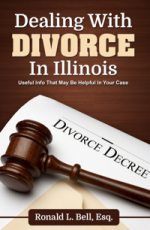 For answers regarding the division of marital property under Illinois Family Law, contact the Libertyville Law Offices of Ronald L Bell & Associates today at 847-495-6000.